A colony of the clubmoss Lycopodium digitatum lives on the bank of the Lake Cheston overflow. 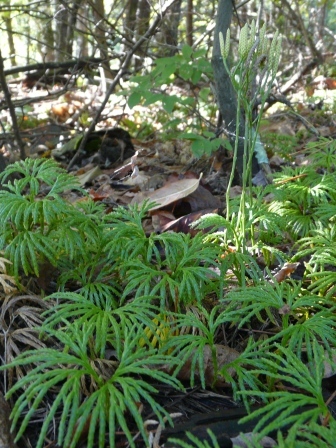 This species is sometimes called running-cedar or fan ground-pine, although it is neither a cedar nor a pine. Rather, it belongs to an ancient group of plants, the Lycopods, that date back more than 400 million years, making them the most ancient of living vascular plants. 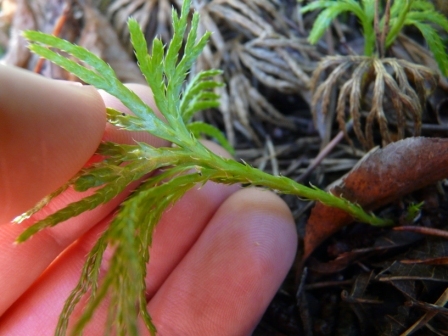 Like other Lycopods, this species has small, scale-like leaves that emerge from the stem. Unlike the leaves of flowering plants, these "mircophyll" leaves are supplied by a simple, unbranched vein. This Lycopodium is a diminished shadow of its ancestors. Three hundred million years ago, another Lycopsid, Lepidodendron, grew in vast forests all across our region (and well beyond, where-ever the Carboniferous coal forests grew). Lepidodendron also had scale-like leaves, restricted to the tips of it long bifurcating branches. These plants grew up to 30m high and their remains form part of the coal deposits that we now use to power our economy. Unless you’re on green power, the light coming from the image of the tiny clubmoss on this post is likely fueled, in part, by these ancient relatives: their stored photosynthetic energy flickers one more time. This entry was posted in Plants on September 25, 2011 by David George Haskell.